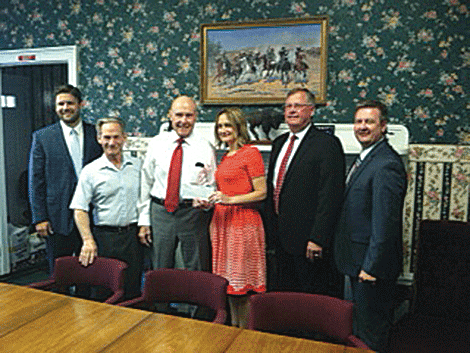 From left, attorney Edward A. Betz, institute director Don Mesibov, attorney Preston C. Carlisle, author April Charleson attorney William W. Carlisle, and attorney Lloyd G. Grandy II. The Student Poverty/Trauma Initiative will use a $1,000 donation to provide resources to staff teams from each of the group’s districts. Among that will be copies of a book by April Charleson, a Massena middle school teacher who was raised in poverty and has written poems detailing her experiences in classrooms and at home. The cash came from Carlisle Law Firm. On July 20 and 21, 59 educators representing 14 schools in seven school districts will launch the Poverty/Trauma Initiative at the Constructivist Conference at St. Lawrence University. School districts represented will include Chateaugay, Gouverneur, Lake Placid, Malone, Massena, Norwood-Norfolk, and Ogdensburg. Teams of staff from Colton-Pierrepont, Copenhagen and Tupper Lake have been participating in the initiative for almost a year, according to institute director Don Mesibov. Saranac Lake and Watertown may join the Initiative in the fall as well as a team of special education teachers from St. Lawrence-Lewis BOCES. A legislative grant provided by Assemblywoman Addie Jenne, D-Theresa, helped launch the initiative last fall.